HOW TO PREPARE A PRINT READY ARTWORK FOR PRINTED PAGES? In this guide, you should find the main things to consider to prepare your print-ready artwork. It's all about starting with the correct setup and know what to look out for. We usually recommend to work with InDesign which is the most common tool to layout pages. Open InDesign. Select file/New Document. Here is an example of an A4 Portrait book with 48 pages. Make sure you set up the margins all around with a minimum of 10mm on top, bottom and outer. You will need to check the recommended margins for the inside depending on the binding you wish to have. You must also set a minimum of 3mm bleed all around the pages. Your first page inside the book will always be on the right hand-side. The odd numbers will always be on a right page and the even numbers on a left page. This is important to remember for the layout. When printing double-sided the binding edge (where the pages will be bound together) will alternate from left to right to left to right, etc... Your page numbers should do too. For some of the binding techniques that we do such as the Japanese binding, we pierce the sewing stations (holes) up to 10mm within the page. 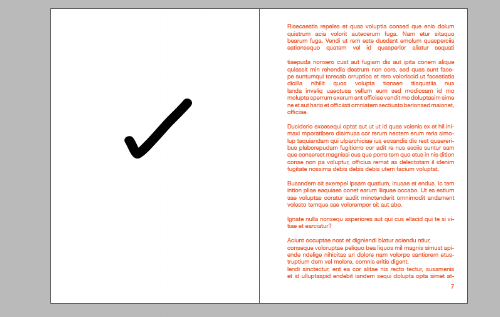 Therefore it is very important that you leave sufficient margins on the binding edge (inside) of your pages so your content isn’t cut-off and still has nice borders around. You can only setup the margins at the very beginning when creating your document as shown above. It is essential to have margins all around your pages. The above right-hand side page has no margins. The text will get trimmed on the edges and will disappear in the binding. This page has 20mm margins on the binding edge (inside). It also has 10mm margins at the top, bottom and outside which is the very minimum we recommend and please include your page numbers within this safe area. The margins sizes on the binding edge will depend on the type of binding you choose. Some binding methods will require more space than others so please check each product page. WHY DID WE SETUP BLEED ON THE DOCUMENT? It is not possible to print to the edges of the page so when there are full bleed images the printers will print on a larger sheet and trim it down. We recommend to leave 3mm bleed all around the pages. The above page has a full-page size image on it but has no bleed. When trimming, some white borders might appear on the edges. These borders are often due to the slight movement of the sheet inside the machine during the printing process. This page has 3mm bleed all around. The bleed is shown by the red line. You will need to extend your images up to this line if you want to have them full page (always hold the shift key when altering image sizes in InDesign to keep the proportions). You can also resize your images in Photoshop by adding 3mm all around the image (so + 6mm in the height and + 6mm in the width) if their current size doesn't allow for any bleed. In Indesign the black line all around the page shows where we will trim. This determines how the contents flow on your pages. Please start your layout with the 1st page of the contents. If you want to print your cover we will send you a cover template and treat them as separate files. Please also make sure to include blank pages where needed. The resolution of an image refers to the density of the pixels (or printed dots) that make up that image or graphic. The higher the resolution, the crisper and more detailed the image will be. A lower resolution will be fuzzy and less detailed. Image resolutions for printing are measured in DPI (Dots Per Inch) referring to the amount and spacing of the Cyan, Magenta, Yellow and Black dots. We recommend to work with 300DPI images. To control the resolution of your images in Photoshop go to the Image tab and click on Image size. You could try to change a 72ppi image file into a 300ppi file by Resizing. This is when Photoshop takes the number of pixels it has to play with and divides them up so that there’s 300 pixels in every inch instead of 72. However Photoshop will soon run out of pixels, therefore the document would be much smaller than its original size. 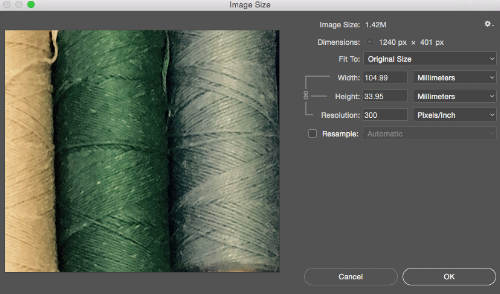 When altering an image size in Photoshop you have two options, resize or resample. If you resample (the default option in Photoshop), you are altering the pixel size of the document. If you resize (by unchecking the resample box), you are altering the resolution and therefore the printed size of the document. Resampling a document up is NOT recommended. Photoshop will have to guess what pixels to insert into the gaps. Resampling a document down is OK, as there are already more than the amount of pixels needed. If you resize an image, you’ll keep the same pixel size, but alter the actual print size and the resolution. So from the start you will have to work with the highest quality images or you might be very limited with their print size. How readable is your text? And how heavy is the stroke weight? Tiny fonts might be hard to read and too thin lines might not come out when printing. Too thin lines might not come out so please choose an appropriate stroke weight. Are you ready for printing? Check here how to export your print ready PDF.